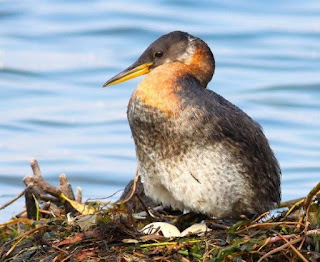 Friends of Sam Smith Park: GREBES EXPECTING AGAIN. After the violent storms early in July, which wiped out the first nest and egg, our valiant grebes have shown some typical Sam Smith fortitude and rebuilt their watery abode. There are at least 2 eggs currently, which were seen as of the end of July. If all things go well, we can expect to see our first baby grebes sometime near the middle of August. Additionally, the newest pair of grebes in the yacht basin are noisily mating and appear to be building a nest beside the orange buoy between the yachts and nest of our original pair. With any luck we may be observing juvenile grebes well into September!